DUG Insight User ManualFrequently Asked QuestionsFrequently Asked Questions Volumes and DataHow do I merge lines from multiple 2D volumes and surveys into a single volume and survey? 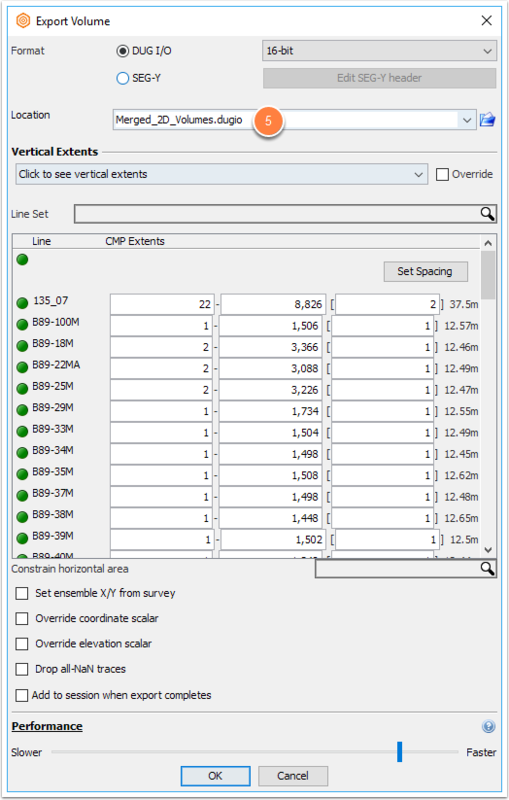 This workflow can be used to efficiently consolidate 2D data contained in multiple 2D volumes spread over several surveys into a single 2D volume and survey. 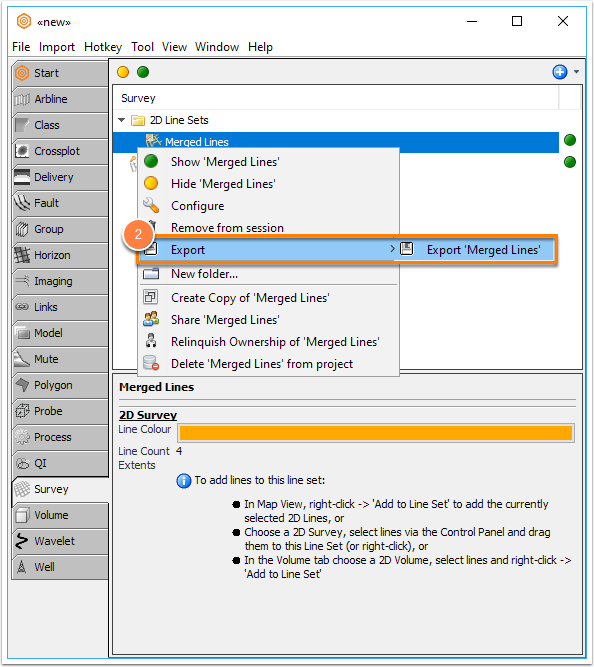 Go to the Survey tab, right-click on the line set, and select Export > Export "line set. Export both 2D volumes to the same .dugio file (see Exporting to DUG I/O). Give the first volume a name, select the location to export to, and click OK. This new volume will contain the merged data. To add lines to the merged volume from the second volume, use the same file name and location when exporting. 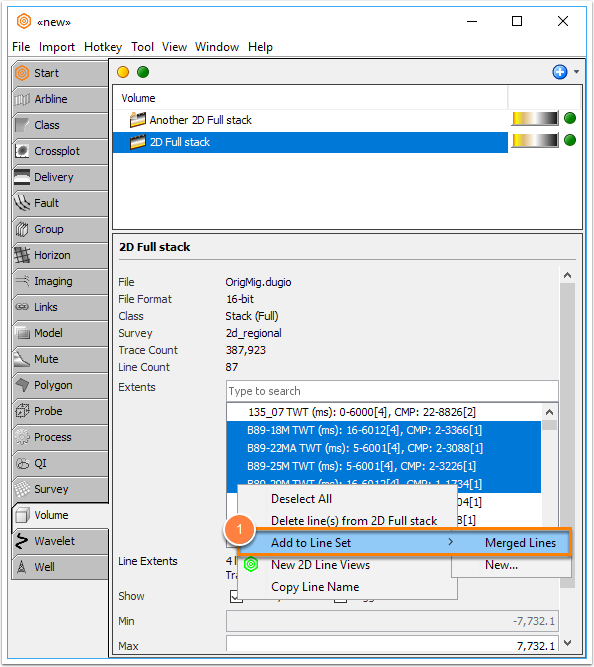 Note: Exporting lines from the second volume to the merged volume will not overwrite data already contained in the merged volume, unless the lines being export are already in the merged volume. Import the merged volumes via Control Panel > Import > Volume. 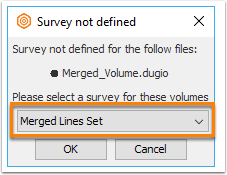 When prompted to select a volume by the Survey not defined window, select the merged line survey imported in Step 2. Next: How do I gain a volume between two horizons, using a spatially varying multiplier?